This post is sponsored by Sugardale Foods and SheKnows Media. As always, all opinions are 100% my own. Thank you so much for supporting We are not Martha! This Apple Spice Glazed Ham with Baked Apples is perfect for serving to your holiday crowd, but you also might not be able to resist making it for your family on a random weeknight… It’s that good (and the leftovers are a huge bonus!). True confession time: Until a few years ago, I had never made a ham myself before. That’s bad enough in itself, but the really embarrassing part? It was just a couple days before Easter and I called my mom from the grocery store frantically saying, “Mom! They only have cooked hams here. What am I supposed to do? ?” She was like, “um, yes Susie… that is how most hams are sold.” I had no idea that you bought hams cooked and then heated them at home. At this point, I considered myself pretty handy in the kitchen, so I felt a little bit of shame over this and I admit, I quickly glanced around me to make sure no one in the grocery store overheard my conversation. At the time, I thought hams were only a special occasion food. And since I had only just bought a house, I wasn’t hosting any holidays or too many guests. But now that I know ham is so ridiculously easy to prepare and how versatile it is, I am all in for ham any time of the year! I should also mention, it’s one of my husband’s very favorite foods and he gets ridiculously happy when he knows I’m making a ham. Because it means delicious dinners for days + new ham dishes + ham sandwiches for lunch. 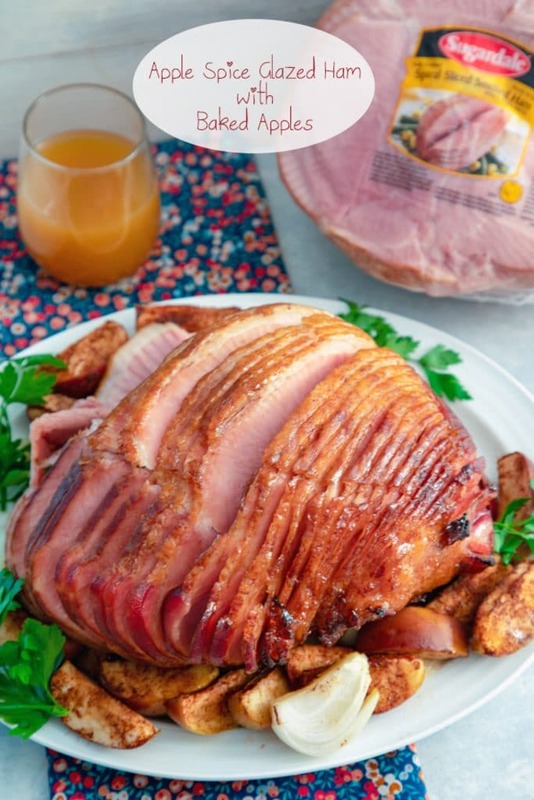 I’m excited to be working with Sugardale® for this post because their Spiral Sliced Hams are so easy to prepare. They’ve been crafting their hams the old-fashioned way for almost 100 years with the same secret blend of smoke and spices that they’re famous for. 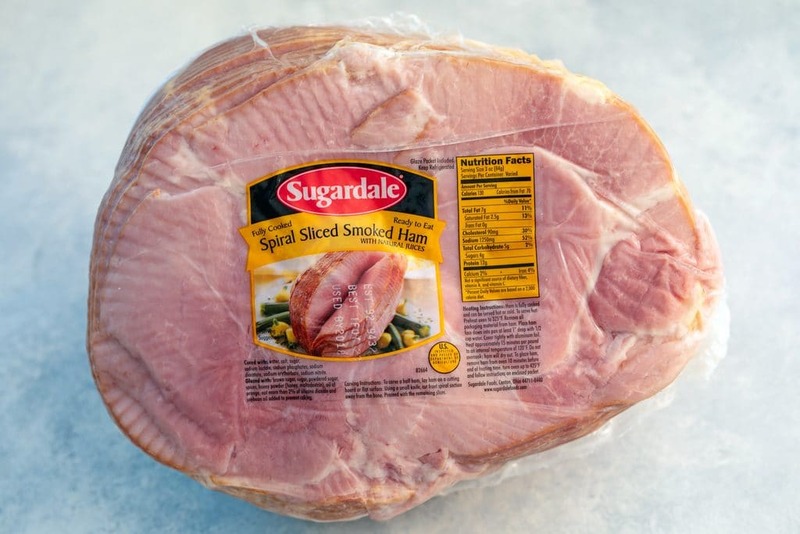 To be honest, there’s not a whole lot you need to do to a Sugardale® Spiral Sliced Ham before popping it in the oven. It’s delicious as is, especially because it’s naturally smoked over real wood chips, rather than with liquid smoke. It even comes with a glaze packet that you can easily use when baking your ham for some extra sweetness. But I wanted to do something a little different and a bit more seasonal, so I decided to make an apple spice glazed ham with baked apples. It’s perfect to enjoy all fall long, straight into the holiday season. 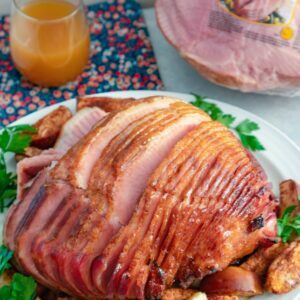 Even with the special glaze and baked apples, this ham is still incredibly easy to have on your table! 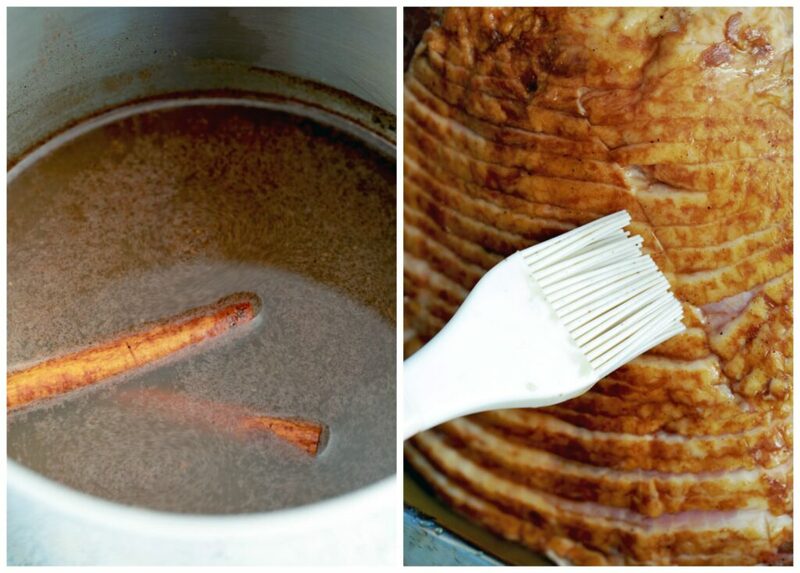 The glaze is simply apple cider, brown sugar, all-spice, nutmeg, and cinnamon sticks. Once you bring the mixture to a boil, lower it to a simmer and cook until it thickens up a bit. I like to brush my ham with half of the glaze and cover it in foil before putting it in the oven. Then, when there are about 40 minutes left to cook it, take it out and brush it with the rest of the glaze, add your apples and onions to the pan, and put it back in the oven without foil. I knew the ham needed more time in the oven, but at this point, I already wanted to dig in! But let it heat a little more and the result is an absolutely beautiful and seasonal ham. Another result is that your house will smell SO SO delicious! And not only does this ham make for a meal (or three! ), but it also makes for a gorgeous table centerpiece. 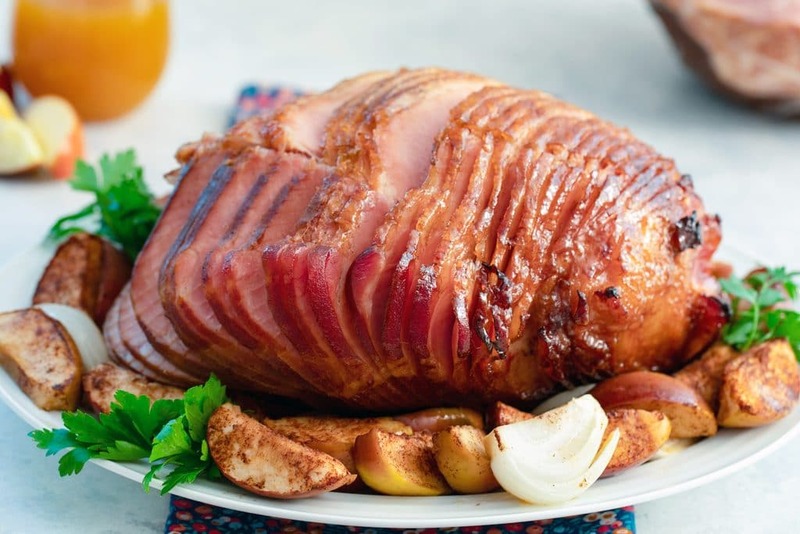 It’s pretty much guaranteed that your guests will be ooh-ing and ahh-ing over this apple spice ham! 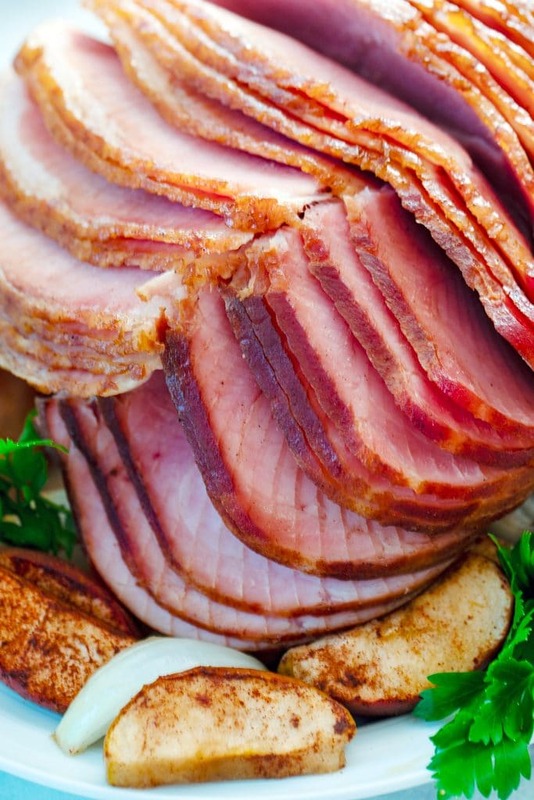 One of my favorite things about Sugardale’s Spiral Sliced Ham is that the cut makes it so easy to serve. Of course, if you’re like me and my husband, you need to get this ham to the table ASAP. Otherwise, you’ll just stand at the counter, pulling off slices of ham and devouring them while your dog stare longingly at you whining loudly. I also love that this apple spice glazed ham with baked apples is both an entree and a side dish. Make sure to serve everyone a few slices of ham AND some baked apples and onions. I just hope you don’t have too many guests over for dinner because you’re certainly going to want some leftovers! And now all I want on a slightly chilly evening is for my entire house to smell like apple spice ham and baked apples. Sooo, who wants to come over for dinner? To learn more about Sugardale®, check out their website and also their store locator to find out where you can get products in your area. In addition to ham, they’re also known for their Natural Uncured Lunch Meats, pepperoni, salami, and bacon. How often do you make ham at home? In a medium saucepan, combine 1 1/4 cup apple cider, brown sugar, 1/2 tsp all-spice, nutmeg, and cinnamon sticks and bring to a boil. Once boiling, lower heat and let mixture simmer for 12-15 minutes, until mixture thickens a bit. Place ham in a baking dish, fat side up and pour 1/2 cup apple cider on the bottom of the pan. Brush about half the apple spice glaze over the ham, making sure to get it into the slices. Cover ham with foil. Bake ham at 325 degrees for 15 minutes per pound of ham. If your ham weighs 10 pounds, you'll want to bake it for about 2.5 hours. When the ham has about 40 minutes left to bake, remove from the oven. Place sliced apples in a bowl and toss with 1/2 tsp of all-spice and cinnamon. Add apples and onions to the bottom of the pan and brush the rest of the glaze on the ham, once again making sure to get in between the slices. Place back in the oven, uncovered, and bake until the ham registers at 130 degrees and the apples are tender. 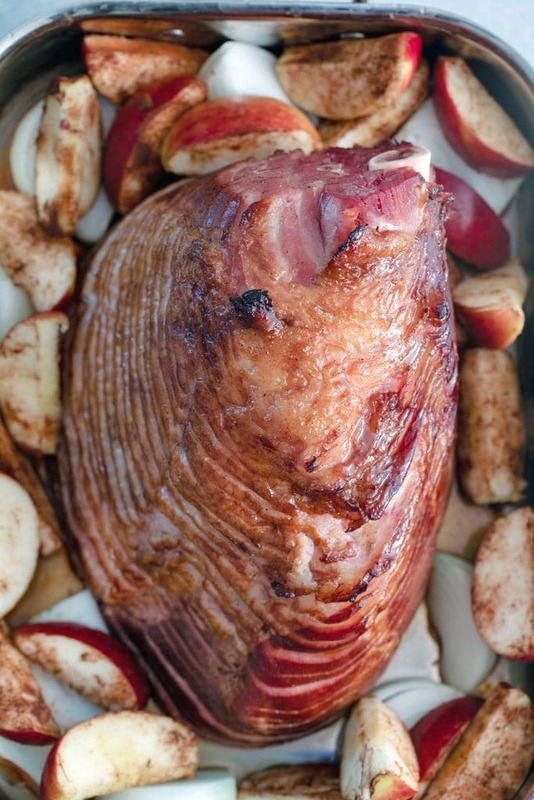 15 Responses to "Apple Spice Glazed Ham with Baked Apples"
This is such a perfect dish for the holidays! Saving this for Thanksgiving! Looks so perfect for my theme this year! Never too early to start thinking about Thanksgiving! Glad you shared this recipe. LOL! I laughed when I read this because the EXACT SAME THING happened to me the first time I made a ham — except I didn’t have the foresight to call my mother — and instead asked the butcher for a “fresh ham” — it was fresh alright. It wasn’t smoked, so it was like a large pork roast when I cooked it. This looks awesome. I know the baked apples are going to be fabulous with this delicious ham! The perfect addition to a holiday meal. What a treat! 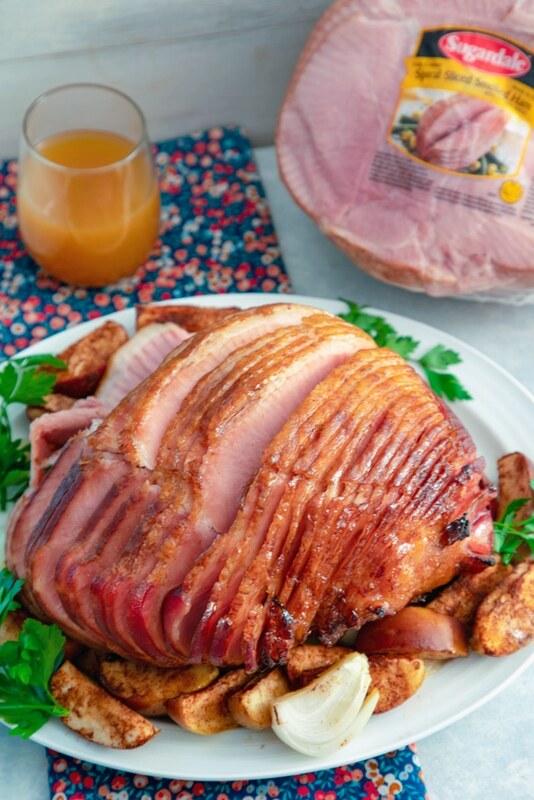 Ham is an ultimate holiday food for us, we also love to make it every once in a while for a weekend party. I love ham in the fall and especially at Thanksgiving. The glaze looks delicious with all the flavors I like. Ham is one of my absolute favourite dishes. We have it every year for New Year. Slightly different here in the UK, but we buy gammon joints that aren’t cooked and boil/roast them. I don’t see many cooked ham’s here at all but I’ll go searching for one to make this! Fabulous, am so glad to read your post and this look so good & more delicious, love your photography as well… i will trying to making this in my upcoming holiday…Thanks for sharing……..! My kids always get so excited when ham is served for dinner. I love your glaze here!! Such a great dish for thanks giving!! This looks so delicious! We don’t have this type of ham prepared in the UK much to my dismay because I want to try this so badly! Will just have to do it with our version of ham. Oh, this ham would be perfect for the holidays. Ham rules in my house and I love the addition of the apples. How amazing does that ham look?? The perfect celebration food! My family would love this!